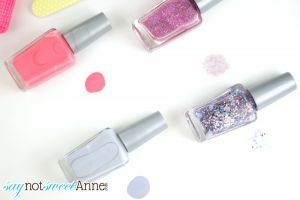 I think it was a couple of years ago that I first started seeing posts about DIY nail polish. The steps were simple: buy a clear topcoat and add crushed eyeshadow to it. I’ll admit, I was more excited than I should have been over the prospect of making my own polish! The trouble I faced, as I’m sure most people who tried that method did, is that the eyeshadow would settle out of the clear coat after a time. Also, adding too much shadow gave the polish a matte effect that I didn’t love. And, some of the glitter I put in… well…melted. Except, that world of amazing polish makers is really complicated for a beginner. So I ended up spending a lot of time (and money) experimenting with the right/wrong thing, asking questions and getting help. But don’t worry! If you are thinking, “dang. I want to make my own polishes, but ain’t no body got time for all that research!” I’ve got you covered. 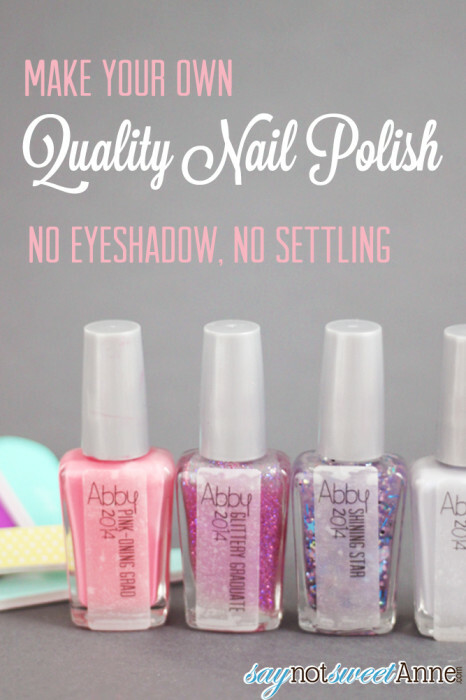 Here is a bare-bones super easy way to make your own quality polish!! A clear coat is not a suitable base for a colored or glitter polish. Glitters and colors require different bases. Not all glitter is created equal. 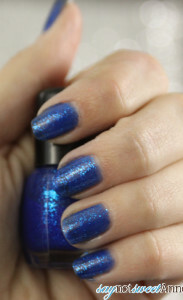 Polyester Color Fast glitter is the only glitter that will not lose its color or melt in the polish base. See? Not so bad, right? Basically if you start with a good base, some high quality glitters and high quality colors, all that is left is to mix your magic color! You can buy the bases at TKB Trading. 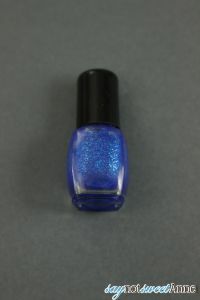 There is a Luster Base for your colored polishes, and Glamour base for your glitters! Bottles are cheapest on eBay and Etsy. But don’t rule out getting cheap topcoats on sale for $.69 and just draining them. I do this with NYC polish bottles all the time! Also, note the size of the bottle you are buying. You’re going to need a funnel. You might think you don’t, but you do. The same mica and mineral colors you used in making DIY Eyeshadow can be used in your polishes! (I love when I can use something I have on hand!) 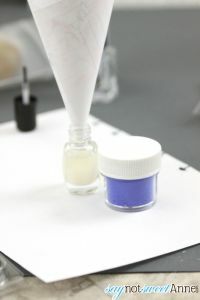 TKB trading sells pigments and liquid colors as well. Mica takes plain colors and makes them metallic. Some colors will need white polish. I recommend buying it from TKB for best results. A rock tumbler packed with old socks makes an excellent polish mixer! Alright, for the tutorial I decided to make a really, really vibrant color. I wanted to see just how bright the mineral pigments would get. It turned out awesome! Then I realized, there is really nothing to this. Its as easy as 1 2 3. Using a funnel, add a bit of your pigment, or a bit of your glitter, or both! Fill the bottle another 25% (so it is 75% full, still room to add more color if needed) and shake! I’ve been putting mine in an old sock and letting it go in the rock tumbler for a couple hours. It makes a perfectly mixed polish with no clumps! That’s it! If you don’t love the color, add more/different pigment and try again. 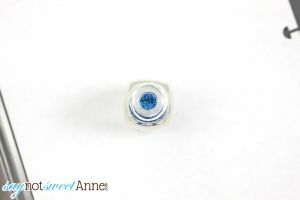 See how vibrant the blue pigment came out? And you can definitely see the glitter in the end result! For my next few polishes I added a lot of TKBs premixed liquid white to make a pretty pastel. Pro tip: To apply glitter polish, apply the polish to a clean makeup sponge. The clear base will absorb and then you can dab the glitter in one movement right onto the nail. This means you can have several “coats” without waiting for them to dry or dealing with too much lacquer! In the past few months I’ve gone a little crazy with the polish making. They make THE CUTEST gifts, and I’ve even done one “commission” for a co-worker’s daughter. What lacquerista wouldn’t want a polish with her name on it? So, if you could make polish match the color of ONE THING – what would it be? You are right, this is a great gift idea! What a fun DIY project. Hi doll! Excellent blog! 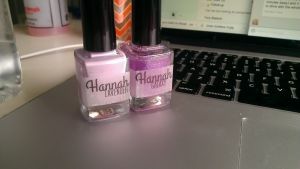 I’m currently researching how to make nail polish on my own and I came across your blog. I am a little confused though about a few things. 2. What on Earth is a rock tumbler? Lol! I feel like a moron for asking but when you mentioned putting socks in it, that totally threw me off. Please help! Lol! A Rock Tumbler is a kid’s toy that you’re meant to put rocks in. It spins slowly for DAYS and that polishes the rocks. I put socks in mine so that the polish doesn’t clunk around, and let the spinning motion of the Rock Tumbler to mix it.